Something exciting is brewing at BOLD that will LIGHT up your day. 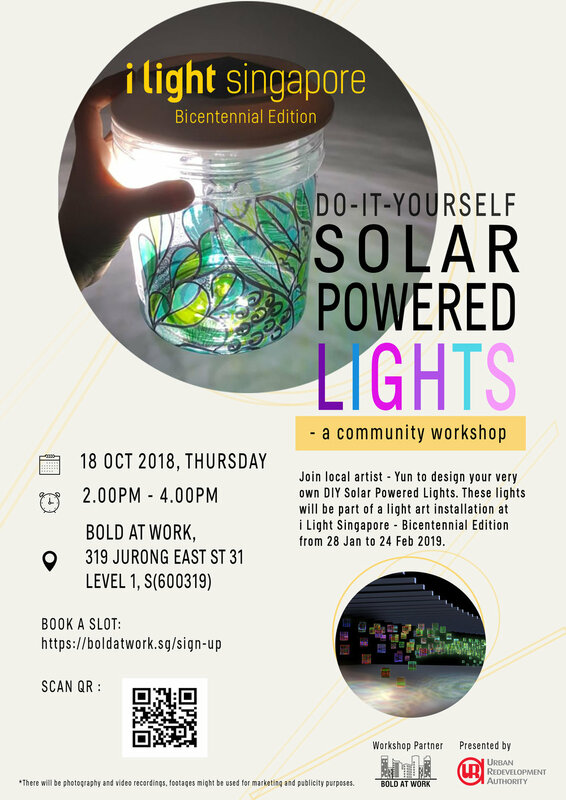 Join local artist - Yun, on 4 November (930am-1130am) to design your very own DIY Solar Powered Lights that will be featured in one of the installations at i Light Singapore - Bicentennial Edition next January! All Ages- Friendly! It’s more than just the doing, it will be a mesh of fun, learning (think- GREEN, think- me and ah ma/ ah Gōng, think- artist Yun and her story behind why she does this) and loads of wafer snacks to share! Limited spaces only.